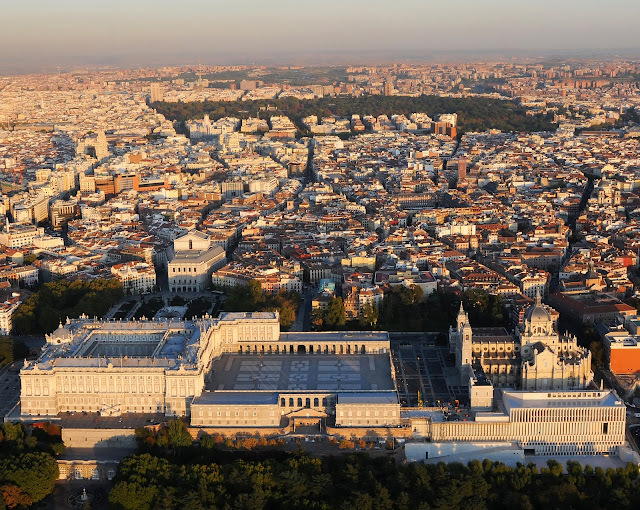 From an urban perspective, the project is based on two fundamental principles: on the one hand, the Royal Collections Museum should be part of the natural/artificial landscape of Madrid’s western edge, and on the other, it is necessary to maintain the open public nature of La Almunena Square and preserve views of the parks and gardens beneath the western lip of the city. The Museum, in its linear structure becomes an inhabited retaining wall, thus reducing the objective (physical) and subjective (collective subconscious) impact on the monumental plinth of the Royal Palace. 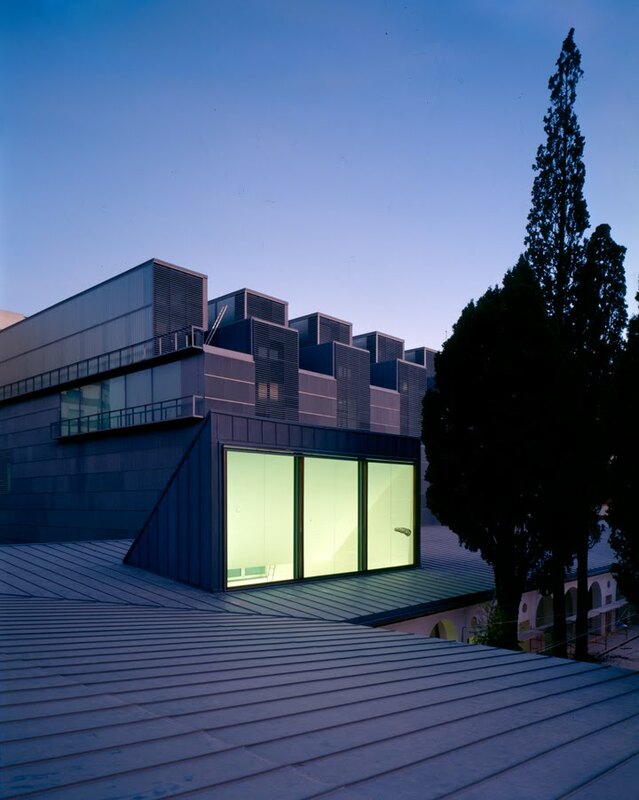 The aim is to produce a building that is invisible from La Almudena Square by occupying the space underground. The Royal Collections Museum completes the plinth of the Royal Palace, constructing a linear space that follows the lines of the Palace itself. A simple and compact building, a construction that is aware that maximum flexibility and potential are only possible within a strict order. It uses the materials of the Royal Palace and its dignified construction as a feature, with a modern layout, heavy yet light, opaque yet transparent. The three exhibition levels –again equal yet different- hold three differentiated collections: tapestries, paintings and carriages. Each space is organised like a warehouse measuring one hundred and fifty by twenty metres, flanked by the remains of the Arab wall to the east and a monumental lattice composed of massive granite pillars to the west, opening to views above the Campo del Moro Royal Gardens. The views across the gardens happen in the space between the structural elements, just like the pillars are matter between voids. The space is the rhythm of the beams, and the installations are the interface between the elements that hold the building up. Structure, illumination, views, space, and infrastructure all have blurred edges and exchanged attributes. The Royal Collections Museum is a plinth for the Palace from the outside; a frame for views of the gardens and the interior features from the inside. The most important things already exist; our job is to make them visible. TECHNICAL DATA. Location: Palacio Real, Madrid, Spain. Architects: Luis M. Mansilla and Emilio Tuñón. Client: Patrimonio Nacional. Collaborators: Matilde Peralta, Rubén Arend, Andrés Regueiro, Clara Moneo, Teresa Cruz, Jaime Gimeno, Stefania Previati, David Nadal, Oscar F. Aguayo, Carlos Martínez de Albornoz, Asa Nakano, María José Castillón, Javier González Galán, Mila Moskalenko. Structural engineers: Alfonso Gómez Gaite. Mechanical engineers: J.G. Asociados. Quantity Surveyor/Technical Architect: Santiago Hernán and Juan Carlos Corona. Competition: 2002. Design project: 2003. General contractor: FCC. Built area: 40.000 m2. Photographer: SURAVIA. (84) RELAIS & CHÂTEAUX ATRIO. 2005-2010. 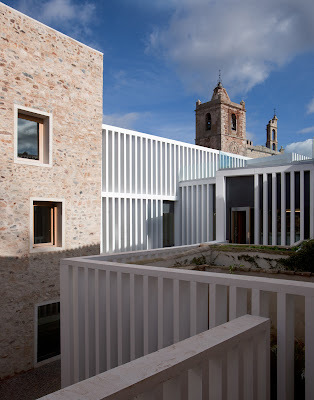 The new Atrio Relais-Châteaux, located at St Matthews Square in Caceres, tries to rethink the city departing from the principles that made it possible in the first place. It tries to imagine how such thing can be carried out in our time, enabling contemporary architecture to stand side by side the historic core, with respect and dignity. Inside the medieval precinct of the city of Caceres, the compound on which the new building has been erected was formed by two volumes deeply degraded after years of neglect. The new construction fits into these buildings like a hermit crab inside an empty seashell. Thus, the new use re-vitalizes and re-habilitates the life-less constructions establishing an organic symbiosis and acquiring a new sense of contemporaneity. What is truly important for us is to accept the fact that there is no such thing as the past or the future, but only our present, the present of our past and the present of our future. This assumption implies a way to understand contemporary architecture as a permanent oscillation between strategies for participation and strategies for environmental coexistence. TECHNICAL DATA. Location: Plaza de San Mateo, Cáceres, Spain. Architects: Luis Mansilla and Emilio Tuñón. Client: San Mateo Hotel SL. Collaborators: Carlos Martínez de Albornoz, Andrés Regueiro, Marceline Ruckstuhl, Carlos Brage, Arabella Masson, Elke Gmyrek, Ignacio Peydro, Teresa Cruz, Anna Partenheimer, Ainoa Prats, Joao Leitao, Bárbara Silva, Carlos Cerezo. Structural engineers: Alfonso Gómez Gaite. Mechanical engineers: J.G. Asociados. Quantity Surveyor/Technical Architect: Fernando Benito Fernández Cabello. Work Completion: 2010. Built area: 3.000 m2 .General contractor: UTE Joca-Placonsa. Photographer: Luis Asín. (101) TWIN HOUSES IN TARIFA. 2006-2009. The proposal departs from the will to construct a building that would suit the dimensions of the site, avoiding oversized volumes, and would take advantage of the optimal qualities of the given situation, topography and natural vegetation. The access to the plot takes place through a single garage, which is common to the two houses. This concrete porch frames the view and produces the first instant of shadow. From there a path leads to the house. 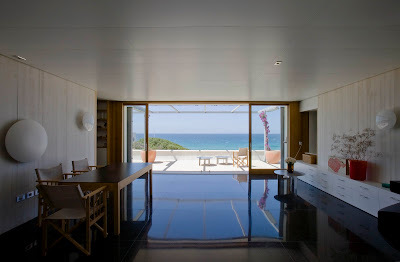 The villas are simple staggered volumes, placed on a platform facing the sea. Each villa has two clusters of rooms that are organized around an ample and almost exterior living room connecting the access patio to the terrace. The structure of exterior meeting spaces is repeated for each of the clusters, which contain a small shadowed patio, intimate and protected from the East. TECHNICAL DATA. Location: Tarifa, Spain. 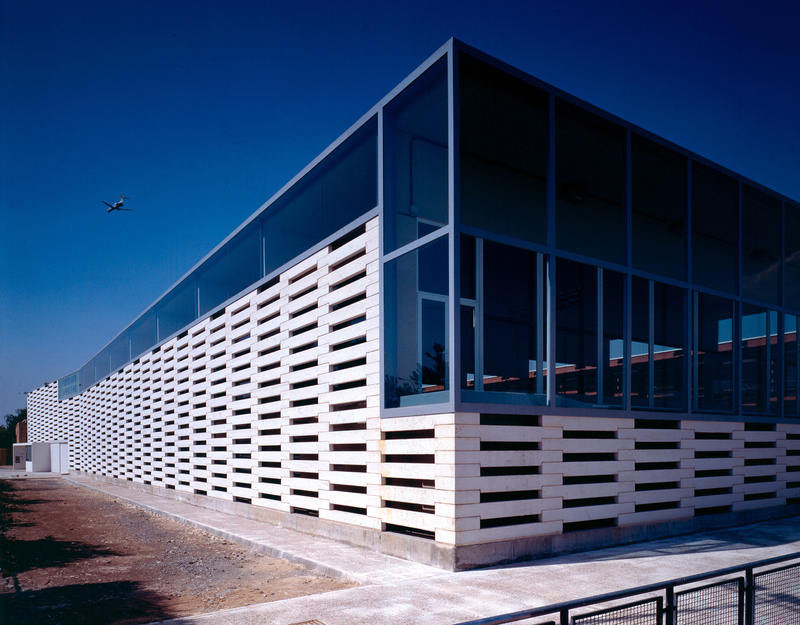 Architects: Luis M. Mansilla and Emilio Tuñón. Client: Vicente Moreno and Luis M. Mansilla. Collaborators: Jesús Vassallo, Ana del Arenal and Arabella Masson. Structural engineers: Alfonso Gómez Gaite. Mechanical engineers: J.G. Asociados. Façade consultants: Grupo Entorno. Quantity Surveyor/Technical Architect: Santiago Hernán. Design project: 2006. Work completion: 2009. Built surface: 400 m². General contractor: VOLCONSA. (83) LALÍN TOWN HALL. 2004-2011. While the present is under construction, the past and the future take new forms. Every single moment, each new action, enables a revision of what has been done, and also lends a new profile to what is about be done, continuously modifying the collective memory as well as the projects to come. In this changing scenario, with a past and a future in constant construction, probability becomes the only approximation to certainty, the only mechanism to approach reality. In the heart of this transformation, architecture widens its vision, regarding the definition of space as only a small part of its assignment: the construction of artificial environments, of the atmosphere in which the actions of mankind unfold. This is a kind of mobilization of the world in which the main tool is the negotiation between the parts, and the aim is the creation of scenarios of wills that will encourage collective identity. 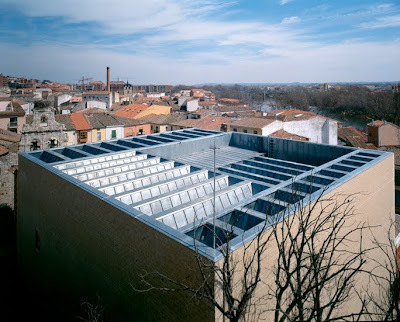 Thus, the proposal for the Concello of Lalín oscillates between precision and probability, building an antimonumental structure in which -as in the clouds- each one can guess personal references in the changing shapes. Therefore, the collective identification is the result of the diversity of interpretations: a technological Celtic village, some colored clouds, a civic palimpsest, a patterned fabric, etc. The proposal is an open structure, almost a mathematical field, that establishes a local behavioural system in dialogue with the environment, choosing the dispersed over the compact, the transparent over the opaque and the diffuse against the limited; a social and architectural structure without hierarchies. TECHNICAL DATA. Location: Lalín, Pontevedra, Spain. Architects: Luis M. Mansilla and Emilio Tuñón. Client: Lalín Town Hall. Collaborators (competition): Andrés Regueiro, Luis Díaz-Mauriño, Carlos Martínez de Albornoz, Anna Partenheimer, María Langarita, Asa Nakano. Collaborators (design project): Andrés Regueiro, Matilde Peralta, María Langarita, Ana del Arenal, Asa Nakano, Bárbara Silva. Structural engineer: Alfonso Gómez Gaite. Collaborators (construction): Andrés Regueiro, Sara Murado, Carlos Brage, Briony Roberts, Rubén Arend, Nuria Martínez Salas, Coco Castillón, Elke Gmyrek, Carlos Cerezo. Structural engineers: Alfonso Gómez Gaite. Mechanical engineers: Quicler-López Ingenieros. Quantity Surveyor/Technical Architect: Sancho Páramo. Competition: November 2004. Design project: July 2005. Work completion: February 2011. Built area: 7,200 m2. General contractor: FCC Construcción. Photographer: Luis Asín. (58) BARRIÉ DE LA MAZA FOUNDATION. 2003-2005. The Pedro Barrié de la Maza Foundation is housed behind the façade of a building designed by Vigo architect Manuel Gómez Román in 1919. The project is a modern, balanced and precise response to the existing container. The fenestration arrangement both conditions and facilitates the resolution of the new office brief using criteria of 'functional flexibility and versatility'. The brief contemplates the materialization of a 'box of miracles', in which every possible activity can be hosted by stacking a series of multipurpose, dynamic, changing stages. All of the floors are similarly organised in two clearly differentiated blocks: a thin bay parallel to the existing façade and a deeper body inside the block. The smaller first bay is a threshold of respect for the existing building, used as a distribution space on each floor. The rooms for exhibitions and diverse events, as well as the technical core for vertical communication and equipment, are all located in the interior block. 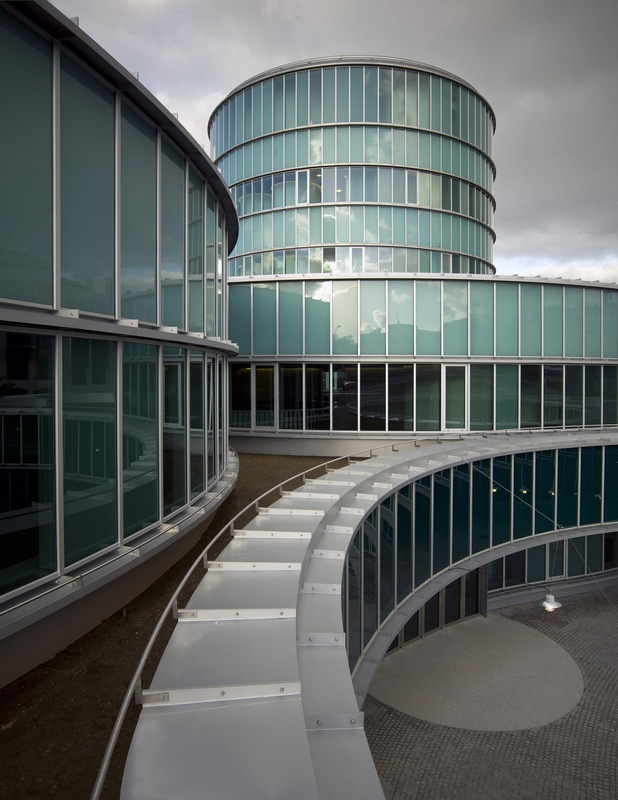 Between the two areas are two large glass lifts, with adjustable transparency, that run the full height of the building, resolving the need for fast access to each level of the construction. On the basis of this organisational model, the proposal maximises the potential flexibility of the building in an attempt to take advantage of its tight dimensions. The most important space in the Foundation is located in the entrance level. This extremely large, tall, flexible, changing lobby is a veritable stage for the activities of the building and it can be transformed by the incorporation of high-end theatrical technology. By changing the floor, juggling panels or making objects and stage curtains descend, it can be used for presentations, exhibitions, concerts, etc. From the ground plan, access is gained via the vertical communications core to the two multipurpose exhibition floors, configured as clear, diaphanous spaces. Finally, the lecture hall is located on the upper floor, featuring a theatre mechanism that enables the seating to be removed, leaving the entire space clear for use as a supplementary exhibition space or a multipurpose workshop. TECHNICAL DATA. Location: Calle Policarpo Sanz nº 31, Vigo, Spain. 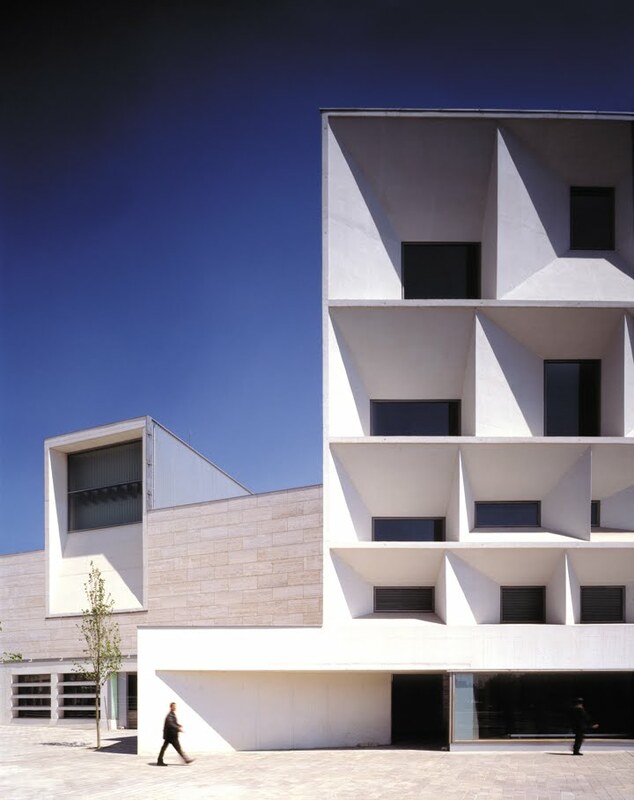 Architects: Luis M. Mansilla and Emilio Tuñón. Client: Pedro Barrié de la Maza Foundation. Collaborators: Pablo Gallego, Ricardo Lorenzana, Teresa Cruz and Matilde Peralta. Structural engineers: Alfonso Gómez Gaite. Mechanical engineers: J.G. Asociados. Construction managers: Luis M. Mansilla, Emilio Tuñón and Pablo Gallego. Quantity Surveyor/Technical Architect: Sancho Páramo. Design project: 2003. Work completion: June 2005. Built area: 3000 m². General contractor: Constructora San José S.A. Photographer: Luis Asín. 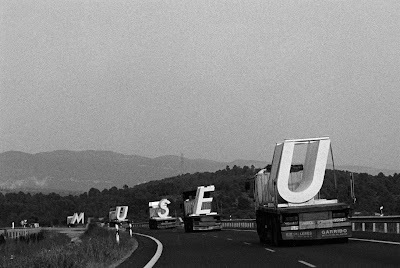 MUSAC delineates a stage for art with the same optimistic attitude used by the Roman surveyors to sketch their cities in the landscape. In contrast to other types of museums, which focus on the exhibition of frozen historic collections, MUSAC is a living space that opens its doors to the wide-ranging manifestations of contemporary art. This is an art centre that constructs a set of chessboards on which the action becomes the protagonist of the space; a structure that develops from an open system, formed by a fabric of squares and rhombi, allowing the construction of a secret geography of memory. MUSAC is a new space for culture, regarded as something that makes visible the connections between man and nature. A cluster of chained but independent rooms that permit exhibitions of differing sizes and types. Each of the jaggedly shaped rooms constructs a continuous yet spatially differentiated area that opens onto the other rooms and courtyards, providing longitudinal, transversal and diagonal views. Five hundred prefab beams enclose a series of spaces that feature systematic repetition and formal expressiveness. Outside, the public space takes on a concave shape to hold the activities and meetings, embraced by large coloured glass in homage to the city as the place for interpersonal relationships. Inside, a large area of continuous, diverse spaces, spattered with courtyards and large skylights, defines an expressive system that speaks to us of the interest shared by architecture and art: the contemporary manifestation of the variable and the perennial, of equality and difference, of universality and transience, an echo of our own diversity and equality as people. Proportionally to its size, that of a single storey building with white concrete walls and large coloured glazing, MUSAC strives to be a space where art is at ease and helps to erase the boundaries between private and public, between work and leisure and ultimately, between art and life. TECHNICAL DATA. Location: Avenida de los Reyes Leoneses, León, Spain. Architects: Luis M. Mansilla and Emilio Tuñón. Client: Gesturcal S.A., Regional Government of Castilla y León. Collaborators: Andrés Regueiro, Luis Díaz-Mauriño, Ainoa Prats, Jaime Gimeno, Matilde Peralta, Clara Moneo, Teresa Cruz, Oscar F. Aguayo, Gregory Peñate, Katrien Vertenten and Ricardo Lorenzana. Structural engineers: Alfonso Gómez Gaite. Mechanical engineers: J.G. Asociados. Construction manager: Luis M. Mansilla, Emilio Tuñón and Andrés Regueiro. Quantity Surveyor/Technical Architect: Arcadio Conde, Santiago Hernán and Juan Carlos Corona. Design project: 2001. Work completion: 2004. Built area: 10.000 m². General contractor: Musac de León UTE (FCC/Teconsa). Photographer: Luis Asín. On the first of July 1999, five trucks transported five letters from Madrid to Castellón. 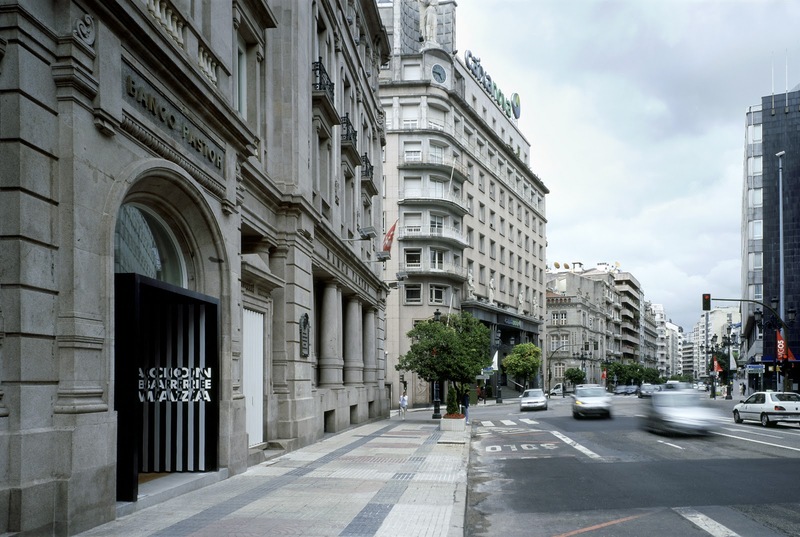 The five letters had been built in white reinforced concrete, in the city of Madrid. The five trucks were the same, the five letters were different. The drivers carried telephones so that they could attend to the orders of the directors of the action. As they moved through the landscape and the towns, the five letters formed a word. The emergence of a word, an intruder, implies a culturization of landscape through thought. A culturization in motion that leaves no lasting mark. An ephemeral action, limited to four hundred and forty kilometres and ten hours of travel. Nature is what a person sees through experience. The task of art is to generate thoughts able to propose new experiences. The task of photography is not to represent or imitate what exists, but to summarize an experience. Therefore, the pictures of this travel reveal the process of a different experience –Just a few documents are left as a trace that freezes time, catalyses memory and at the same time challenges the disappearance of the ephemeral. The movement of the five letters on trucks must be understood as a “travel with weight”, reminding us of the mass of the earth that claims for itself everything that moves on its surface. The aim of this ephemeral installation has to do with the earth (two ways of colonizing: the gaze and the footprint) and with time (two ways of measuring: distance and movement). The emergence of these intruding letters, before the changing eyes of people, provokes a transformation of the different territories that are crossed by the road. A sort of spatial appropriation through the footprint and the gaze –a material confrontation between the language of the particular and the language of the universal. The continuous and accelerating frictions between the language of the particular and the language of the universal, between simultaneously being one and part of a group, inaugurate the moment of invisibility. The globalisation of culture and the respect to difference call for a wordless consensus. Today it is necessary to make ideas invisible, in order to clear the path for an architecture made from the frictions of living as presentation -not representation- of life… The architecture of tomorrow does not ask for forms, but for the marrow of forms, an architecture with a succinct body, just enough to stand up. If something characterizes today’s architecture, it is the architect’s capacity to explore and exploit, with a critical and ironic attitude, preferably with a sense of humour, the apparent restrictions and difficulties of the profession in our time. TECHNICAL DATA. Photographer: Luis Asín. (34-35) COMMUNITY OF MADRID DOCUMENTATION CENTRE. 1994-2002. From the outset of this project, the powerful and ominous open spaces of the former El Aguila brewery, by then unknown to the public, were the driving force for the arrangement of the different activities. This was carried out through the construction of voids, interfaces and expansions of surfaces as part of an effort to visualise an exterior space which modernism had regarded as a mere void. The space between the buildings has thus become the defining element, upgrading multiple itineraries, planes of activity and information and changing the linear nature of the complex as a whole by establishing invisible links between the different constructions with their industrial scale and materials. 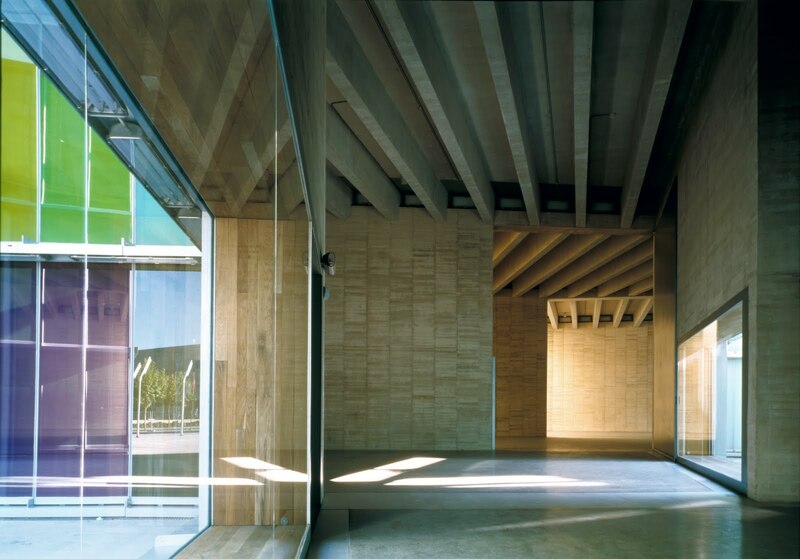 The Madrid Regional Government Archives and Library in the former El Águila brewery is a centre for the preservation, custody and dissemination of the Region’s historic documentary heritage, ultimately aimed at ensuring the transparency of administrative processes and citizen’s rights. The construction, an extension of the Paseo del Prado cultural axis, is part of the political desire to open Madrid to the south and the cultural desire to safeguard the remains of the city’s historic industrial heritage. TECHNICAL DATA. Location: Former El Águila Brewery, calle General Lacy, Madrid, Spain. 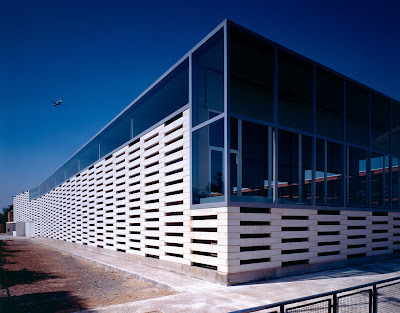 Architects: Luis M. Mansilla and Emilio Tuñón. Client: Madrid Regional Goverment. Collaborators: Matilde Peralta, Andrés Regueiro, Ainoa Prats, Oscar F. Aguayo, Jaime Gimeno, Fernando García-Pino, María Linares, David Nadal, Robert Reininger. Structural engineers: Alfonso Gómez Gaite. Mechanical engineers: J.G. Asociados. Graphic design: Gráfica Futura. Construction manager: Luis M. Mansilla, Emilio Tuñón and Ainoa Prats. Furniture and equipment manager: Oscar F. Aguayo. Quantity Surveyor/Technical Architect: Santiago Hernán and Juan Carlos Corona. Competition: 1994. Design project: 1996-1998. Work completion: 2002. Built area: 40.000 m2. General contractor: Dragados y Construcciones, S.A. Photographer: Luis Asín. (33) FINE ARTS MUSEUM OF CASTELLÓN. 1996-2000. The Fine Arts museum of Castellón is planned around a courtyard with magnificent cypresses, which used to belong to the former school of Serra Espada. The building housing the exhibition rooms is a stack of identical floors in which a double-height space is shifted forming a tiered series of voids that, while using identical elements, turns each floor into a different space. Slender in its proportions and facing the front, the museum guards the treasures of the city like a sphinx, protected by a shell of cast aluminium slates. The program of the museum is organized in four separate areas: public, semi-public, work and storage. Located in the central building, around the landscaped cloister, are the private museum annexes and offices (semi-public area). 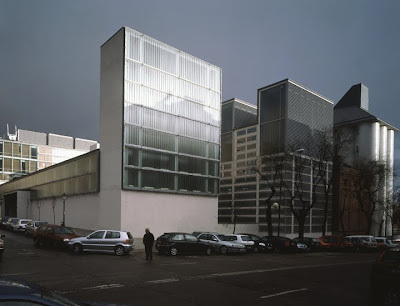 Next to it, on the eastern side, a newly designed, cube-shaped construction is built to shelter the exhibition rooms of the permanent collection (public area). On the western side, and separated from the rest of the buildings, a new longitudinal building houses the restoration department (the working area). Finally, the storage space, which is located on the basement, connects the working areas with the public building. The artwork exhibited in this museum is made up of four collections. The museum had therefore to merge four permanent exhibitions into one building without each one of them losing its personality. The main building, which houses the permanent collection, is constructed as a stack of five floors that are different and yet the same. The five exhibition levels are linked by a cascade of double-height voids that provide a diagonal view spanning the entire section of the building. This sectional device enables a strong spatial compactness to be wed to a diversity of spaces which can be perceived as a succession of three scales: that of the exhibition rooms, that of the double-height voids, and that of the building as a whole that is seen through the diagonal space. The Leon Auditorium pays homage to Ortega y Gasset’s concept of ‘seeing and being seen’, while responding to the model consolidated by the Manuel de Falla Auditorium in Granada. It is an exercise in realism, its small size guaranteeing a certain economy of means, and also reducing its presence in the city. It is precisely this small-scale perception that leads to the exhibition hall being conceived as a separate piece, allowing the building to simultaneously benefit from the historically established costume of small foregrounds while also orienting the building towards the San Marcos Hostal, and by this means outlining a new visual order on the existing platform. The auditorium thus turns its lion’s head in a plateresque echo of the San Marcos church, its face constructed as a stack of windows in which two diverse orders appear: the perimeter of the apertures that refer to the geometry of the construction, and the inner aperture of each window, fruit of the necessities of the interior. The constructed plane thus oscillates between a group of stacked windows that are equal in their being and different in their form of being. Additionally, the main volume of the building, relegated to the background, projects its section until it becomes an elevation; an extruded volume whose profile is lightened by placing more emphasis on the surface than in the mass. TECHNICAL DATA. Location: Avenida Reyes Leoneses, León, Spain. Architects: Luis M. Mansilla and Emilio Tuñón. Client: Regional Government of Castilla y León, Municipality of León. Collaborators: Andrés Regueiro, Fernando García-Pino, María Linares and Matilde Peralta. Structural engineers: Alfonso Gómez Gaite. Mechanical engineers: J.G. Asociados. Acoustic engineers: Higini Arau. Graphic design: Gráfica Futura. Construction managers: Luis M. Mansilla, Emilio Tuñón and Andrés Regueiro. Quantity Surveyor/Technical Architect: Santiago Hernán and Juan Carlos Corona. Competition: 1994. Design project: 1996. Work completion: 2002. Built area: 9.000 m2. General contractor: Auditorio UTE (FCC/CRS). Photographer: Luis Asin. (24) SWIMMING CENTRE IN SAN FERNANDO DE HENARES. 1994-1998. The Swimming Centre completes a series of municipal sports facilities built through the last decades. The building, set northeast of the urban core develops along a promenade with a plantation of pines near the Henares River. The scheme is a straightforward linear succession of elements: vestibule, changing rooms and utility core, instruction vessel and multipurpose vessel. The new construction materialises externally as a great basket weaved with prefab concrete girders, set parallel to the Pine Promenade. The project links the entrance to the complex with the three buildings at the northern end, by means of a small porch that leads onto a common foyer. The basket of prefab beams blurs the edge of the construction: during the day, the hall and the lobby receive sunlight filtered through the façade, while at night, the building becomes an illuminated beacon, a soft glow for the people strolling along the Pine Promenade. Due to the proximity of the water table, the building is raised above ground level. The Swimming Centre is on the first floor, leaving the ground floor of the new building for storage and services. This solution mitigates the problems caused by the proximity of the Henares River, and makes the main hall dominant over the degraded surroundings while providing a clearer vision of the horizon and the nearby mass of trees. TECHNICAL DATA. Location: Paseo de los Pinos, San Fernando de Henares, Madrid. Architects: Luis M. Mansilla and Emilio Tuñón. Client: Municipality of San Fernando de Henares. Collaborators: Andrés Regueiro, Fernando García-Pino, Matilde Peralta, David Nadal and Robert Reininger. Structural engineers: Alfonso Gómez Gaite. Mechanical engineers: J.G. Asociados. Quantity Surveyor/Technical Architect: Santiago Hernán and Juan Carlos Corona. Design project: January 1994. Work completion: December 1998. Built area: 2.500 m². General contractor: Fomento de Construcciones y Contratas SA. Photographer: Luis Asín. Outside town, and beneath the overhang of the wall facing the River Duero, the museum presents itself to the town as a coffer containing its jewels, its memory. The museum is like a trunk that has been cut of one single stroke, in which a host of skylights with the same cross-section define various spaces through their different positions, heights and orientations. The museum is organized as a tour through the remains of history, taking a Celtiberian votive stele exhibited in the museum as its formal reference. The structure is accommodated inside a cubic block of strong outline. A range of topographical outcrops and buildings of different sorts surrounding the building reinforce this impression. The complex disavows an axial academic composition, its overall quality leaning towards an architecture which is produced via a slippage between its various components, thus breaking up its overall appearance and forcing people to walk between the buildings, almost touching them, in such a way that the interstices between the volumes and the rock enhance the buildings per se.